W, Pay 1 life: Prevent the next 2 damage that would be dealt to target creature this turn. 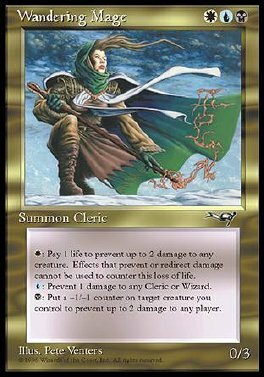 U: Prevent the next 1 damage that would be dealt to target Cleric or Wizard this turn. B, Put a -1/-1 counter on a creature you control: Prevent the next 2 damage that would be dealt to target player this turn.